Sign me up for the eMarketer Daily Newsletter, a daily briefing on digital marketing and media trends. Also includes eMarketer FYI - partner webinar announcements, whitepaper offers and more. Sign me up for the eMarketer Daily Newsletter. A daily briefing on digital marketing and media trends; three new articles each day. Please also include eMarketer FYI mailings. Partner webinar and event announcements, whitepaper offers, best practices guides, and research briefs. Sign me up for the eMarketer Retail Newsletter, featuring articles and interviews covering retailer performance, store productivity and consumer spending. Also includes Retail FYI - partner webinar announcements, whitepaper offers and more. 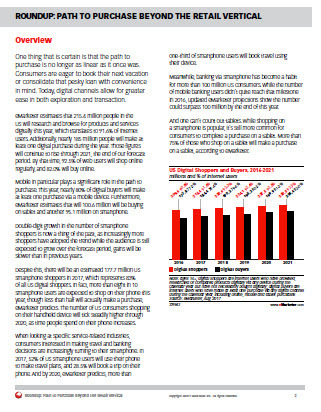 Sign me up for the eMarketer Retail Newsletter, which features our latest articles and interviews covering retailer performance, store productivity and consumer spending. Sign me up for the eMarketer Retail FYI, which includes partner webinar and event announcements, whitepaper offers, best practices guides, and research briefs of interest to the eMarketer Retail Weekly audience. Sign me up for the eMarketer Marketing Technology Weekly, featuring research and data about the converging worlds of marketing and technology. Also includes Marketing Technology FYI - partner webinar announcements, whitepaper offers and more. Please also include Marketing Technology FYI mailings. Partner webinar and event announcements, whitepaper offers, best practices guides, and research briefs. Please sign me up for occasional updates about eMarketer products and services; complimentary offers to download sponsor-supported eMarketer content; as well as invitations to exclusive webinars and events. Copyright © eMarketer Inc. All Rights Reserved.